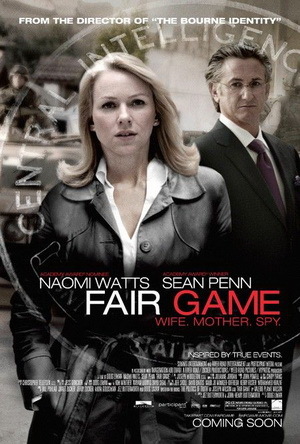 "Fair Game" is the biopic of CIA spy, Valerie Plame and her husband, U.S. Ambassador, Joseph C. Wilson. It is based on Plame's book "Fair Game: My Life as a Spy, My Betrayal by the White House." And betrayed she was, as the corrupt Bush Administration vengefully outed her as a spy, endangering her life, because they were upset at Wilson's report stating there are no nuclear weapons in Iraq. The movie explores the time frame leading up to former U.S. President George W. Bush’s illegal invasion of Iraq, which was based on the deceitful premise that dictator Saddam Hussein, had obtained and was about to use Weapons of Mass Destruction against the world. Prior to the war, Wilson was sent on a mission to ascertain the truth and when he debunked said claims, the Bush Administration, who only invaded Iraq to steal oil, grew enraged. Due to lack of self-control and being power obsessed, the Bush Administration vengefully exposed Plame as a spy, which could have gotten her killed by terrorists. Those were bad times for America, because people watched disheartened as the White House broke the law, then used a presidential pardon to get away with it. A judge also unjustly dismissed Plame's lawsuit against Bush & co, which was the wrong thing to do under the circumstances. However, things did not pan out for Bush , as his presidency devolved into abject failure and disgrace. Bush and Cheney set in motion events that would bankrupt America and destroy the government's name in the world. The film "Fair Game" had good special efx and sets, but the acting was not as strong as it could have been. Had the film been done in a different way, more people would have filled theaters to view it, as it is a good story worth telling.